It’s worth the grief your daughter gives you when you have to tell her that she’s too young to date or that she’s getting into a relationship that’s not good for her. It’s worth the groans from your kids when you won’t let them watch a movie that everyone else at school got to see, even the Christian kids whose parents weren’t quite so uptight about it. It’s worth their complaints when you have to limit the amount of time your kids spend on the phone or on the Internet. Knowing how to say no firmly may make them hate you for a moment, but it will make them love you for a lifetime. And you’ll have the pleasure of seeing your children experience the peaceful fruit of righteousness. Stop worrying about being your child’s buddy. You are the only one in the world with the primary responsibility of giving your child what he needs, not what he wants. Sometimes that means you have to lay down the law. Afterward you may have to go close yourself up in the bedroom and, with tears in your eyes, tell your spouse how bad you feel for being so hard on your kids. You’ll probably need to check yourself occasionally to make sure you’re not over the top with your discipline, letting your mate reel you back in if you’re getting out of balance. But one way or another, you’ll need to enforce the values and biblical principles that God has spelled out in His Word and laid on your heart. You’ll need to be firmly convinced that you’re preparing your child for a lifetime of fruitfulness. You may not be popular for a moment, but you’ll rest easy at night knowing that you’re saving your child from a life of destructive habits. One of the saddest stories in the Bible is of a permissive parent. Eli the priest loved his two sons, Hophni and Phinehas, and rebuked them only mildly for their indiscretions. He was well aware that they stole people’s offerings to the Lord to fill their own stomachs and seduced the young women who came to worship in Shiloh. Still, he only told them to stop; he never actually enforced any kind of discipline on them. If you’ve read the first few chapters of 1 Samuel, you know the result. God swore to cut off Eli’s family forever. On one horrible day, the Israelites were defeated in battle, the Philistines captured the Ark of God, and Hophni and Phinehas were killed. When Eli heard the news, he fell off his chair, broke his neck, and died. It was one of Israel’s most devastating moments, all because an old priest wouldn’t discipline his sons. I’ve always found this story extremely sobering. As much as I want my kids to like me, and as much as I hate conflict in our home, this story rattles me and gives me the backbone to do what’s right rather than what’s convenient. I’m sure Eli loved his sons; that wasn’t the issue. The problem was that his love never trans­lated into discipline and his sons never learned obedience — first not to their father, and therefore not to God. The consequences were tragic. Eli’s permissiveness not only destroyed a family, it wounded a nation. Parenting Myth: Your kids will feel most secure if they know you’re their buddy. Parenting Reality: Your kids will feel most secure if they know you have set appropriate boundaries for them that you aren’t afraid to enforce. You have higher ambitions for your children, don’t you? You want them to grow up bearing the fruit of righteousness, which always leads to lasting joy. That’s why it’s absolutely imperative to learn how to say no. Be willing to let your children get mad at you from time to time. Keep your eyes on their ultimate welfare instead of on their momentary comfort. 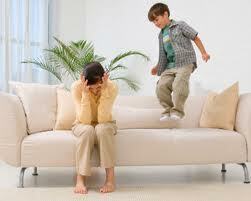 Effective parenting always requires effective discipline. You probably struggle with what that discipline should look like. I certainly did. How do you know when it’s too harsh, or when it’s not harsh enough? How do you know when you’re disciplining a child for his own welfare and when you’re punishing him out of your own frustration? The difference between discipline and punishment may seem subtle in your own experience, but from God’s perspective, it’s a monumental distinc­tion. As we get into the nuts and bolts of discipline in the next chapter, you’ll see how His perspective can answer those questions. Ask your spouse and/or a good friend — people who can be completely honest with you — to examine Reuben Hill’s analysis of the four styles of parenting (see the overview article, “Effective Child Discipline”). Then ask them to describe where you fit on the grid and to give some examples that support their opinion. (For some of us, it may be hard not to get defensive, but try to listen with an open mind.) Does your perception of your parenting line up with what your spouse/friends have told you? If you believe change in your parenting style is needed, how might you adjust your style to best suit the emotional needs of your children?